Plants have recently only been able to protect the world from zombies on PCs and iPhones, leaving the Nintendo DS to fend for itself, until now. Plants vs Zombies has already taken over the PC, Mac, and iPhone, and is planned for release on Xbox Live Arcade in September. Now Nintendo fans will be able to experience the joy of defending their houses from zombies too as PopCap has announced that the very popular tower-defense game will be coming to the Nintendo DS in January 2011. 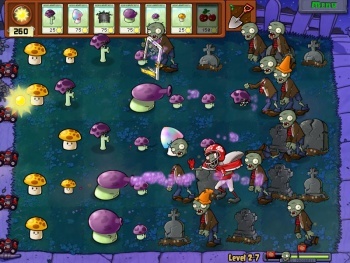 Millions of people have purchased Plants vs Zombies since its original release in May 2009. PopCap hopes that by spreading the infection to the Nintendo DS that it'll keep on going until it can't be stopped. The DS version of Plants vs Zombies will include the Adventure, Survival, and Puzzle modes already available in other versions, along with their mini-games, but PopCap also promises "new and exclusive" game content. Depending on what this means, it could make Nintendo's handheld the platform with the most complete edition of the game. Or it could just be a couple of exclusive zombies. Plants vs Zombies for the DS will be priced reasonably at $19.95, which should make it an easy purchase for gamers looking for a fun handheld experience involving the undead. Which is great, just as long as none of those gamers are prison guards.